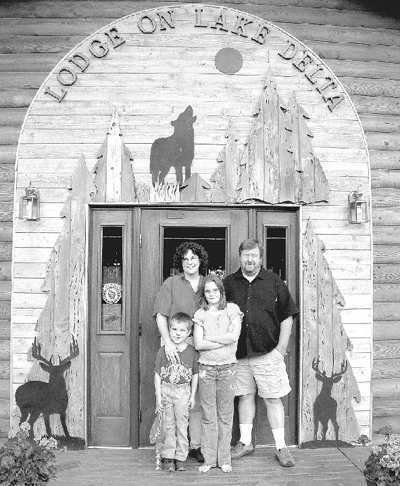 A FAMILY ESTABLISHMENT - The Pajtash family of Delta, from back left, Patty,, Terry, Wyatt and Arianna, stand at the entrance of their lodge, which houses a bar and grille at Scenic Drive Resort. Rick Davis built the log structure in 200 and is now adding a wrap-around deck looking out over Lake Delta that is slated for completion by this winter. TOWN OF DELTA-In their 14th season as owners of the Scenic Drive Resort, Terry and Patty Pajtash are accustomed to hosting a wide variety of guests, some of whom fly in and out at a moment's notice. "We've got an eagle out here fishing," Terry says, looking out the main lodge's window onto the crystal-clear waters of Lake Delta. "We've had this guy hanging around all summer." 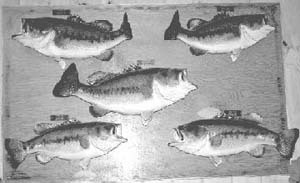 The inside of the lodge's bar and grill is speckled with tributes to the outdoors, from a sign that reads "Welcome Back Hunters" to video games such "Fisherman's Bait" and "Deer Hunting USA" and five mounted bass. Opening in April 2000, the new lodge was built about a quarter of mile down the road from the original tavern and lodge, which also served as the Pajtash's home. "With two little kids, we ran out of room," Terry said. "It was time to make the move." Since buying the resort from Kurt and Donna Engstrom in 1990, the Pajtashs have also remodeled all five of the visitors cabins, adding more modern amenities such as stoves, refrigerators, heat and furniture to make them livable year-round. Terry said they serve a diverse clientele, from those who just want to "sit and read a book" to fisherman, hunters, and hikers who want access to the North County Trail. The Patjashs own 1,100 feet of lakeshore along Lake Delta, which offers a good supply of northerns, bass, bluegills, muskies and trout. Public lake access is available at the nearby Lake Delta campground. With seven years of advertising on the Internet, at www.scenicdrive.com, the Pajtashs have started attracting people from around the country to stay at their quaint little resort deep in Wisconsin's Chequamegon Forest. The resort's location in the center of Bayfield County also allows guests to travel extensively in the area, Terry said, as they are an hour or less away from Ashland, Hayward and Duluth. "Day trips are easy, and you can come home to a nice, quiet cabin," Terry said. Even with all the national exposure they have received over the Internet, the Pajtashs still depend on loyalty from the surrounding community. "Our bread and butter is our local customers," Patty said. "We definitely go for a family atmosphere." One of the best reasons for families to bring their kids to Scenic Drive Resort, according to Patty, is "youth social director" Arianna, 10, and her 6-year-old assistant, Wyatt. The Pajtashs' two children love hanging out with the younger guests, and showing them around the place where they grew up. As a community gathering place where people share hunting and fishing stories, the Pajtashs' bar and grille is also the local hot spot for Green Bay Packers fans who stop by during every game to cheer on Wisconsin's beloved football team. "We ring the bell whenever there's a touchdown," Arianna said. A sign at the intersection of Scenic Drive clearly designates the resort as "Packers Country," but the owners are willing to accommodate out-of-state loyalties. "We do accept Vikings fans at our establishment," Patty says, smiling. Whether rooting on the Pack, staying at a cabin or just stopping by after work, guests can enjoy a full menu of meals from the grille, which is open Monday 4-10 p.m., and the rest of the week, 11 a.m. to 10 p.m.
Their specialties include a ribeye steak sandwich and buttered grilled asparagus, and the newest items are Asiago stuffed olives and chicken chipolte poppers. Every Tuesday is Rib Night, featuring Sir Charles Savannah's Sittin' Sauce. "Many of the customers have claimed its the best in Bayfield County," Patty said. Having reached this level of familiarity in the area is a dream come true for the Pajtashs, who have already reached several goals in their 14 years of owning the resort, including remodeling the cabins and building a new lodge. Growing up in Ashland, Terry met Patty in Duluth and they chose Delta to try out their shared vision of owning their own resort. "The real jewel of Delta is its people," Terry said. "If the people didn't support us, we'd be gone a long time ago." Two people, Rick and Susan Davis, have been particularly instrumental in helping them along, as Patty calls the couple their mentors. 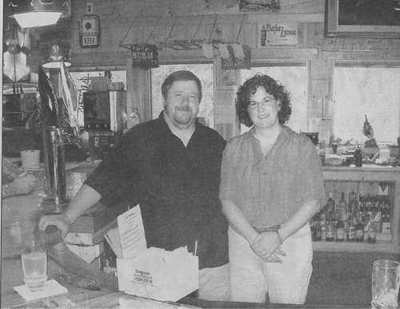 "They taught us that we're not just selling a beer or a cabin; we're selling memories here," Patty said. "So, I hope we're selling many good memories." To reserve a cabin at Scenic Drive Resort, call 715-372-4336, or 715-413-0761 or send an e-mail to relax@scenicdrive.com. The resort is located south of Highway 2 off County Trunk Highway H at 12770 Scenic Drive, Iron River, WI, 54847. HOSTS - Terry and Patty Paftash stand behind the bar of the main lodge at Scenic Drive Resort in the town of Delta, where they serve a variety of meals, from rib-eye steak sandwiches and buttered grilled asparagus to their well-known ribs with Sir Savannah Style Sittn' Sauce for every Tuesday's Rib Night. They also hold Green Bay Packers parties for local fans of the green and gold. 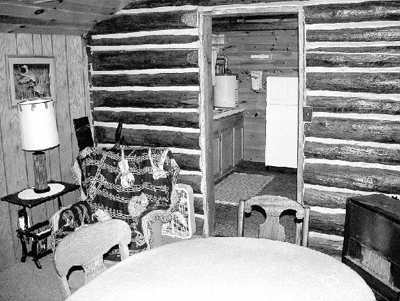 COZY QUARTERS - The five cedar cabins at Scenic Drive Resort date back to the early 20th century and weree remodeled in the 1990's. Each one includes a stove, dishes, cooking utensils, refrigerator, skillets, toaster, coffeemaker, barbeque grill, bed linens, and blankets. PERSONAL TOUCH - Arianna Pajtash, 10, sits by one of her family's five visitors cabine at Scenic Drive Resort in the town of Delta. When the cabins were remodeled, Arianna and her brother Wyatt wrote their names and put their handprints in the cement holding the logs together.